Daniel Walcott realizes that he’s at his best when he’s abrasive. 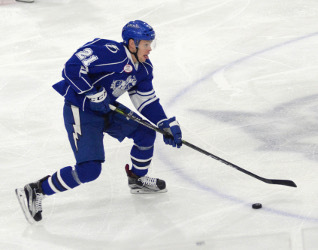 The Syracuse Crunch forward prides himself on his play on the forecheck and ability to rile up opponents. Walcott can also chuck some fists when the time comes. Since moving from defense to forward full-time earlier this season, Walcott has focused on bringing energy to the Crunch lineup.